Kierkegaard has always enjoyed a rich reception in the fields of theology and religious studies. This reception might seem obvious given that he is one of the most important Christian writers of the nineteenth century, but Kierkegaard was by no means a straightforward theologian in any traditional sense. He had no enduring interest in some of the main fields of theology such as church history or biblical studies, and he was strikingly silent on many key Christian dogmas. Moreover, he harbored a degree of animosity towards the university theologians and churchmen of his own day. Despite this, he has been a source of inspiration for numerous religious writers from different denominations and traditions. 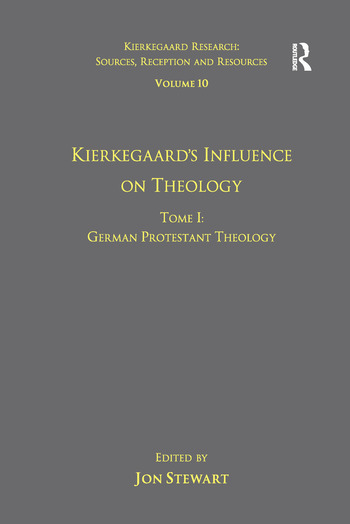 Tome I is dedicated to the reception of Kierkegaard among German Protestant theologians and religious thinkers. The writings of some of these figures turned out to be instrumental for Kierkegaard's breakthrough internationally shortly after the turn of the twentieth century. Leading figures of the movement of 'dialectical theology' such as Karl Barth, Emil Brunner, Paul Tillich and Rudolf Bultmann spawned a steadily growing awareness of and interest in Kierkegaard's thought among generations of German theology students. Emanuel Hirsch was greatly influenced by Kierkegaard and proved instrumental in disseminating his thought by producing the first complete German edition of Kierkegaard's published works. Both Barth and Hirsch established unique ways of reading and appropriating Kierkegaard, which to a certain degree determined the direction and course of Kierkegaard studies right up to our own times. Contents: Preface; Karl Barth: the dialectic of attraction and repulsion, Lee C. Barrett; Dietrich Bonhoeffer: standing 'in the tradition of Paul, Luther, Kierkegaard, in the tradition of genuine Christian thinking', Christiane Tietz; Emil Brunner: polemically promoting Kierkegaard's Christian philosophy of encounter, Curtis L. Thompson; Rudolf Bultmann: faith, love and self-understanding, Heiko Schulz; Gerhard Ebeling: appreciation and critical appropriation of Kierkegaard, Derek R. Nelson; Emanuel Hirsch: a Germanic dialogue with 'Saint SÃ¸ren', Matthias Wilke; Jurgen Moltmann: taking a moment for Trinitarian eschatology, Curtis L. Thompson; Franz Overbeck: Kierkegaard and the decay of Christianity, David R. Law; Wolfhart Pannenberg: Kierkegaard's anthropology tantalizing public theology's reasoning hope, Curtis L. Thompson; Christoph Schrempf: the 'Swabian Socrates' as translator of Kierkegaard, Gerhard Schreiber; Helmut Thielicke: Kierkegaard's subjectivity for a theology of being, Kyle A. Roberts; Paul Tillich: an ambivalent appropriation, Lee C. Barrett; Ernst Troeltsch: Kierkegaard, compromise and dialectical theology, Mark Chapman; Indexes.